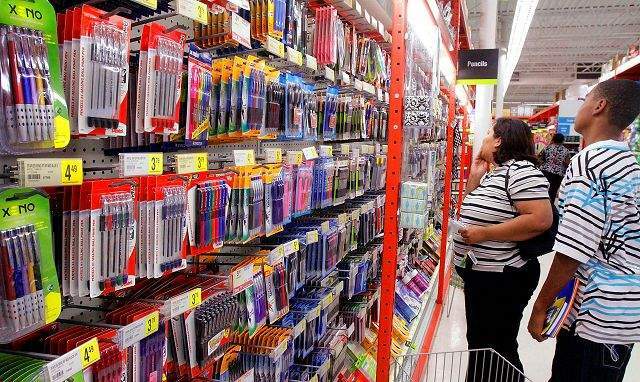 Parents and students shop for back-to-school supplies at the Staples Office Supply store in Springfield, Ill.
NEW YORK  Like millions of other parents this time of year, Im about to embark on the annual scavenger hunt known as back-to-school shopping. I thought this dreadful ritual would get easier when my youngest son reached middle school, but in fact, it merely multiplied from one nerve-racking list to six  along with the number of teachers he has. I would be fine if these lists were simple reminders of basic supplies  pencils, pens, paper, notebooks. Sure, they need a few folders and a book bag, and as math gets more complicated, graph paper and a calculator. I even can understand index cards, Post-its and a yellow highlighter. But how many times do you see parents wandering up and down the aisles of Staples or Walmart or OfficeMax searching for items that either dont exist or that have sold out in a frenzy as mothers of every kid in Miss So-and-Sos class fought for the last graph paper, marble composition book, fine-point Flair pen or half-inch three-ring binder (no one-inchers allowed!) on earth? Other school supplies simply vanish once they are in my home, only to be found years later. My older son recently graduated from high school and cleaned his room for the first time in Id rather not say how many years. Somewhere in that horrifying mess  on the floor, under the bed, in drawers and the closet  he was harboring, Im not kidding, hundreds upon hundreds of pens and pencils. I always wondered how we went through so many of them every year, and now I know. Every time he needed a writing implement, he used it once, then apparently threw it into the landfill otherwise known as his room. Either that, or hes like those cat hoarders who have 37 felines in their homes, only hes hoarding Bic ballpoints and No. 2 pencils. I will admit that one aspect of back-to-school supply shopping is tougher for parents of younger kids than parents of teens. The little kids teachers still want arts and crafts-type supplies, and some of these can be pretty obscure. Another issue I have is with all the supplies ordered up by teachers to keep my children organized. In September, I dutifully purchase whatever they require: The accordion file with alphabetical pockets! Double-pocket folders! Spiral-bound notebooks with one pocket inside the front cover! But it makes no difference. At the end of the year, all of my childrens school work is in a giant random stack of paper, organized neither by subject nor date. The good news is, because so many school supplies go untouched, I can recycle them. I just have to hope that the teacher who orders up college-ruled marble composition books this year wont mind that Im substituting last years wide-ruled spirals. And that the unused Pokemon folders from the late 90s are so old, the kids see them as retro rather than out-of-date. Then again, since chances are slim that those folders actually will be used, it probably wont matter.